Fadumo explains MSF's mental health project in Chikurubi Maximum Security Prison in Harare, Zimbabwe. As human beings we must be aware that without a “healthy mind” we have no health at all. Almost everywhere in the world we can find deficiencies in mental health education, treatment and awareness. In many developing countries mental health needs are not even included in policymaking or health budgets. 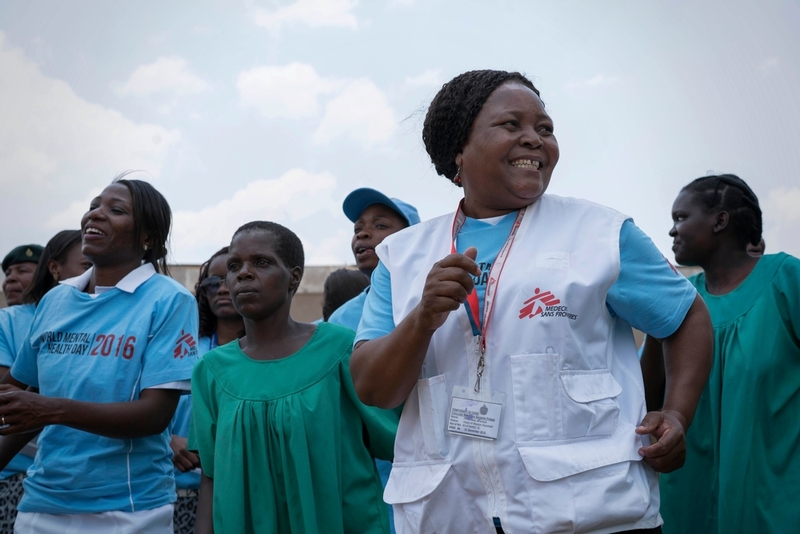 I have been mental health activities manager for MSF in Zimbabwe for over a year now and my job is to shape the vision and direction of mental health and wellbeing in our projects. I am responsible for training and supervising psychologists and counsellors for our projects, creating mental health resources and mental health education and awareness for our beneficiaries, their families and their communities. MSF has been working in Zimbabwe since 2002. The initial focus was emergency response including malnutrition, measles, typhoid and cholera, as well as an ongoing HIV/TB intervention. In working side-by-side with the Zimbabwean Ministry of Health (MOH) MSF observed a lack of facilities for people living with psychiatric disorders such as schizophrenia, autism and bipolar disorder. In Zimbabwe, psychiatric patients are often imprisoned due to a lack of adequate mental healthcare facilities. Psychiatric patients can be sent to prison even if they have only committed minor crimes or if their families cannot cope with them. Often their state of mental wellbeing at the time of their crime is not taken into account and they can spend the rest of their lives in prison. MSF advocates for patients with mental illnesses to be transferred to a rehabilitation hospital; they should not have been sent to a prison in the first place. MSF mental health interventions take place in ten prisons across Zimbabwe, including Chikurubi Maximum Security Prison in Harare. As well as the psychiatric detainees, we have also been working with the general prison population. MSF conducted orientation sessions for all inmates, not solely those with mental illness, when they first arrive in prison as people can often experience breakdowns when the reality of the prison environment sinks in. Psychologists conducted the sessions for mentally detained patients while the general prison population would have orientation delivered by other prisoners who have been trained by MSF to be peer to peer educators. For psychiatric patients our occupational health therapist arranged wellbeing activities to keep inmates sane and active and to learn skills for when they are discharged or released. There was sport, music, chess competitions, drawing and arts sessions, and also training in vocational skills like knitting and gardening. We even had a rabbit farming project! It is important that those with mental health problems get as much support as possible, and not only from their healthcare professionals. MSF provides training for all prison staff in the management of psychiatric patients and other inmates are trained to act as peer to peer educators so they could help orientate and educate new arrivals to the prison. We also took steps to treat people’s mental health after their release from prison. We established links with 13 clinics at the community level that provide a range of healthcare services, known as polyclinics. The MSF discharge team, in collaboration with polyclinic nurses, provides bi-weekly follow-up consultations at thirteen local polyclinics in Greater Harare, according to the psychiatric needs of the MH patients, as well as on-the-job training and support to Ministry of Health and Child Welfare staff. Discharged patients, especially those released from prison, are linked with polyclinics in the outlying communities and families are offered psycho-education during the patient’s imprisonment or hospitalisation. The aim of psycho-education is for patients and families to understand the need to adhere to all kinds of treatments, like psychotropic medications, and follow-up in the local polyclinics. At the same time, we worked with other organisations such as Friendship Bench and Health Watch Zimbabwe who focus on empowering community health workers in linking psychiatric patients from community to polyclinic. It makes me really proud to think how we have empowered local communities so that they are able to continue helping mental health patients long after MSF departs. By the end of 2017, MSF will have handed over the mental health project but I am very optimistic about what we will leave behind. I am proud to say that we have taken mental health intervention into the heart of communities and are leaving behind knowledgeable human resources and solid community mental health settings which are supported by institutions. We have established a range of mental health interventions in Zimbabwe and I am pleased that patients will continue to receive quality, multidisciplinary, treatment for years to come. Syrian refugees: "The healing process is not only physical but also mental and emotional"